The pretzel burgers and Blue Chips nachos don't just look pretty – Plan B Burger boasts that their meat is ground fresh twice daily. 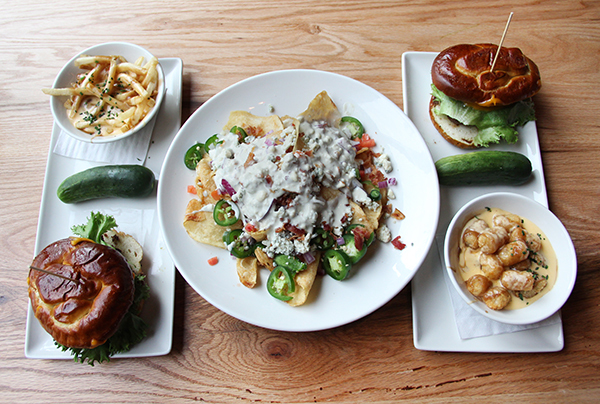 The Connecticut-based chain has built a cult following and is now trying to make it in Penn Quarter. A late-night burger from Burger, Tap & Shake or a sloppy double patty from Whole Foods might be quick fixes to satisfy your craving. But a new burger joint called Plan B Burger Bar is more than worth the trip to the Federal Triangle Metro station. While its name may make it sound like option No. 2, Plan B will quickly become your No. 1 stop for artisan burgers. Hailing from Connecticut, where the chain has somewhat of a cult following, Plan B opened its first D.C. storefront in Penn Quarter on Monday. Old-fashioned light bulbs and dark wood create a bar-like atmosphere in the upscale burger joint, which makes sense because, in addition to burgers, Plan B specializes in two other b’s: beer and bourbon. Plan B emphasizes freshness: The menu proudly proclaims that the meat is ground fresh twice a day and is hormone and antibiotic free. I chose the Pretzel burger ($12.79), and when it arrived at the table, it was clear that the patty was not factory made. A little irregularly shaped and uneven, this burger had character and even with its visual imperfections, it was appealing to my hungry eyes. The patty, cooked perfectly to my order of “some pink,” came served on a warm pretzel bun with the buttery texture of a fresh Auntie Anne’s pretzel minus the artificial ingredients. Lathered with a coating of spicy mustard – the good French kind with whole mustard seeds – and a healthy helping of melted cheddar cheese, it was a challenge to eat without the patty slipping out of the pretzel bun, but the best meals involve a little mess. And when you get the tots (because, let’s face it, you will get the tots) make sure to get them “disco” – covered in a sloppy mixture of salty gravy and melted cheese. This is not finger food by any means, and a spoon might have been better suited than a fork to fish them out of the pool of gravy. The initial crispiness of the tots slowly gave in to the melted cheese, allowing the potatoes to soak up the sauce. Like most sandwiches, the burger came with a pickle, but a Plan B pickle isn’t your typical dill. It’s more of a slightly-cured cucumber than a vinegar-soaked pickle. It provided a bright green pop of color on the plate, and the minty flavor of the cucumber was a nice palate cleanser once the burger and the tots were gone. Still, don’t bite in if you’re expecting a sour vinegar taste. Other menu standouts were the New Englander ($15.99), an homage to the joint’s home state topped with lobster, smoked gouda, caramelized onions, lettuce and a tomato corn spread, and the Buffalo Chicken ($11.49), which substitutes the classic lettuce and tomato combo for carrots and celery. As for appetizers, the Blue Chips ($9.29) are a must. An Americanized nacho, these homemade potato chips come covered in a gooey blue cheese sauce, fresh jalapeño slices, tomatoes and bacon. While the pungent flavor of blue cheese is typically overpowering, the sauce mellowed out the sharpness, allowing the spicy jalapeño to assert itself on every chip. The menu doesn’t stop at burgers and appetizers. Plan B offers hearty salads, dinner plates like Lobster Mac & Cheese ($21.99), and a dessert menu with each item costing $6.50, including a double chocolate cake, called The B Cup, and Bourbon Pineapple Upside Down Cake.